Composer, set designer and film and musical show director, born in 1939 in Besançon. With a diploma in the sciences (maths, terrestrial physics, etc. 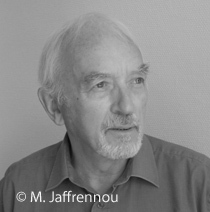 ), Pierre-Alain Jaffrennou studied at the Conservatoire de Besançon, as well as th Paris Conservatory in the electro-acoustic class of Pierre Schaeffer. A researcher and composer at the GRM (1971-1977), he founded, with Francis Regnier, the Laboratoire de Recherche en Informatique Musicale (computer music research laboratory), working notably on sound synthesis and treatment. After being in charge of music for the Comédie de Besançon, he set up in Lyons in 1981, with James Giroudon, the Grame, since declared an official national centre for musical creation, directing it and also dealing with its international development. He is a titular teacher in the arts and technique of representation at the École d’Architecture in Lyons and in 1989 founded Aria, a laboratory for applications and research into computing and architecture. Having a particular interest in spatial sound production and stage direction (Les voix du sacré, 2006), he has devised and directed some large-scale music shows. His works are marked by the art-science relationship and by the use of computing in composition. Pierre-Alain Jaffrennou writes purely instrumental music (Propos, 1988) no less than electro-acoustic (Nuit blanche, 1971; Musica mobile, 2001) or works with electronics (Suite for cello and tape, 1987; opera Jumelles, 1989; 4+4 for quartet and real-time processing, 2014). Les partitions de Pierre-Alain Jaffrennou sont éditées par Grame.